For many people, a pet is a vital member of the family. In the same way that we’d want our children taken care of in our absence, we want the best for our animals if we should ever leave them behind. 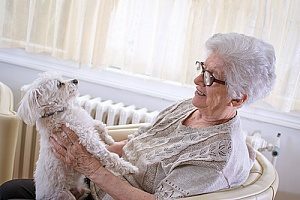 While you cannot leave your beloved pets money or property (tell that to the late Leona Helmsley), a well-drafted estate plan can help you help your pet to lead a good life in the event of your death. Estate planning is just as essential for your family as it is for your pet. If you are among the 65 percent of households in America that own at least one pet, you may have thought about what would happen to your pet if you passed away. In the best case scenario, a family member or friend would step into to take over the caregiving duties. However, this does not always happen, especially in smaller families where there are few or no heirs. Many times, a pet will end up in an animal shelter to be put up for adoption or euthanized. Money or property cannot be left to a pet in your will. If you try, these resources will instead be included in your residuary estate when you pass. However, you can use your living trust or will to leave your pet and funds to a trusted caretaker. For example, say you want to leave your Golden Retriever to your daughter, but she is on a tight budget and unable to pay for dog food and vet bills. Your will can stipulate that your daughter receive the dog as well as the money to care for it. Because your pet will belong to someone else after your death, this type of arrangement is considered legal. However, it is important to understand that the person to whom your bequeath your pet has no obligation to use the money given from your will on your pet. The funds are given to the person outright, and they can use it as they wish with no legal recourse. For this reason, it is important to leave your pet to someone whom you trust. It is also a good idea to have an alternate caretaker in your will in the event that the first cannot fulfill their duty. Although pet trusts can help ensure that your pet is well cared for after your death, they can be quite expensive and somewhat inflexible if certain circumstances following your death should alter the terms. However, trusts create a legal obligation and are available in all states. Once you have made the basic decisions regarding your pet’s future, you will need to formalize your terms to ensure that they are carried out. A trusts & estates attorney can assist with the creation and implementation of an estate plan. For more information about estate planning or how to get started, contact a trusts & estates attorney at Odin, Feldman, & Pittleman today.